The UpLite features two 120cm x 90cm (4' x 3') double sided reflectors which attach together to form a hinge on one side and on the opposite side an adjustable support bracket attaches to create a 'wedge' shape. 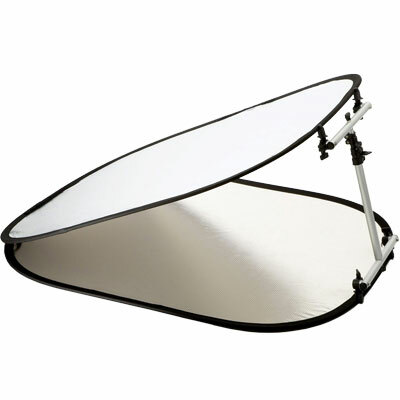 The bracket can be used to adjust the reflector angle from 30 degrees to 80 degrees. A waterproof shower cap is also supplied to protect the reflective surface touching the floor when the UpLite is used outdoors. Waterproof sprung steel also ensures a durable product whatever the conditions. The two reflectors detatch from each other to be used as individual hand held panels.